It's such a relief to discover that a book on audience engagement contains regular, specific and substantive case studies. My last venture into this area of research was a little heavy on the theory, and lighter on the illustrations of the ideas in action. Bergeron and Tuttle do a respectable job here of presenting varied case studies to bring their positions to light. What's interesting to consider is what they don't access in terms of demonstrable results for the six organizations they cite in detail.This research rose from very interesting timing. Bergeron and Tuttle prepared for a very popular talk on engagement shortly after the financial recession of 2008, and that led to this, which means their studies are colored by that influence and they were "on the ground" as it were for a time of great challenge and struggle for museums and like institutions. The result is a study and set of institutional priorities that address long-term results and priorities alongside a good balance of reality about non-profit institutions day-to-day struggles and concerns.What feels lacking, just three years out from the book's date of publish, is sufficient emphasis on and exploration of digital engagement. It's here, but occasionally and subordinate to more traditional success metrics. Given the extreme impact over the past several years of even social-media metrics - much less the burgeoning yet already-robust metrics related to public engagement - this feels like a loss. I'd love a follow-up that emphasized these goals and tools, and helped us all better understand engagement overall through their incorporation. Using a lot of great case studies this book examines Museums and what makes them appealing, engaging, and successful in today's world. I think this is a great read for museum professionals. It also helped me reflect on a lot of good ideas implemented by other museums and examine how my own institution aligns with some of the keys to magnetism. This is a must-read for anyone and everyone who loves museums, but worries about their relevancy and sustainability. Powerful case studies, and plenty of ways to make it work at your institution. Tons of ideas, and it certainly helped me shape some ongoing thoughts about the future of my own institution. I read this book for a class in my Museum Studies masters program, but that being said it still inspired me to do great things in the institution I currently work in! 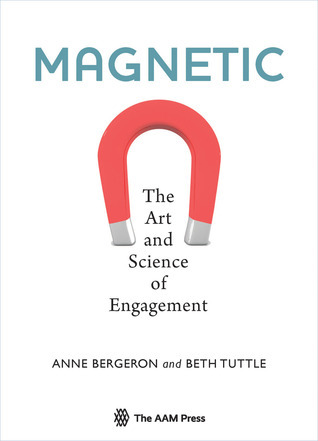 If you feel your organization is in a slump, be inspired by Magnetic Museums!